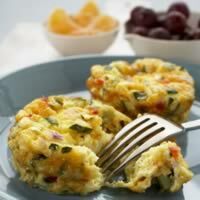 Frittatas taste good cold and travel well—perfect for picnic fare or a take-along lunch. Beat eggs, milk, thyme, salt, and pepper in medium bowl until blended. Heat butter in 6 to 8-inch nonstick omelet pan or skillet over medium heat until melted. Pour in egg mixture; cook over low to medium heat until eggs are almost set, about 8–10 minutes. Remove from heat. Cover and let stand until eggs are completely set and no visible liquid egg remains, 5–10 minutes. Cut into wedges.